Once reserved for the ultra-rich, ping pong tables have come a long way since first popping up in 1880s Victorian England as an after-dinner parlor game for the upper class. Nowadays, people enjoy playing ping pong recreationally on tables that are found poolside at resorts, on the decks of cruise ships and inside bars. The staff at Li-Ning has even known owners of ping pong tables to remove the net, fit it with a suitable table cloth and invite their large family over for Thanksgiving dinners or special events. Because of the growing popularity of ping pong, which became an Olympic sport in 1988 in its more competitive form of table tennis, the Li-Ning Table Tennis Superstore wants to make owning a ping pong table easy for you whether you are interested in fun or professional play. With just enough indoor and outdoor tables to choose from, you can enjoy the convenience of ordering online while saving on the ping pong table of your choice without getting bogged down in the confusion of various table specifications. When you order online at Li-Ning Table Tennis Superstore, you will have peace of mind knowing that your ping pong table will be constructed with high-tech materials, in an appealing color and fit in just the right spot! Simply make two decisions about the type of ping pong table you are looking for: 1. Do you want to play indoor or outside? 2. Are you interested in a regulation size table, or if space a consideration, is a mini table that is slightly smaller a better fit for you? Then, simply click to order. 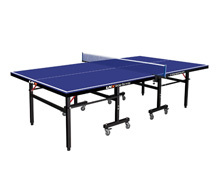 Your indoor ping pong table will be constructed of long-lasting particle board that offers players a true bounce while outdoor options are designed to weather the elements with a sheen, waterproof sheet of molded plastic construction. Both options are large enough for singles (2 players) or doubles (4 players) competition and all Li-Ning ping pong tables fold up. Fold up one end for solo ball return practice or fold both ends for convenient storage. 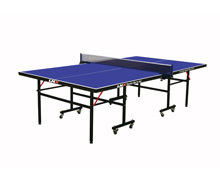 The dimensions for an official size table tennis table are 152.5 cm wide by 274 cm long, by 76 cm high. The net should be 15.25 cm high and hang off each edge by 15.25 cm. 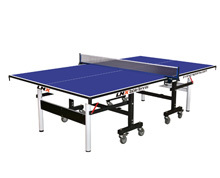 If you need something smaller, simply choose a Li-Ning ping pong table with the word “MINI” in the description. These smaller tables still sit at the same regulation playing height but are more compact at 84 cm wide by 178 cm long. Anything is possible for your new Li-Ning ping pong table because they all are constructed with sturdy steel frames and heavy-duty wheels designed for easy moving. Lock the wheels in place and your table is ready to endure world-class athletic play or novice amateurs having fun.Just make sure if you decide to convert your ping pong table into a dinner table for the night that your crazy uncle, (you know we all have one) doesn’t spill his beverage! Li-Ning is the foremost USA and Canada destination for ping pong tables, table tennis clothing, table tennis accessories and more. Shop online anytime to discover our wide selection of ping pong paddles, balls, accessories and quality table tennis clothing for men and women. 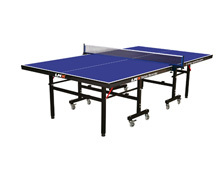 A good selection of Li-Ning ping pong tables are available via the Li-Ning Table Tennis Superstore website which serves the USA and Canada and are intended to help table tennis enthusiasts gain easy acces to table tennis products. Contact Li-Ning Table Tennis Superstore toll-free weekdays at 855-6LI-NING, or send us a message using our handy online form.